So I play guitar (a little) and I used to play Guitar Hero on PS2 from time to time. Last year, for Christmas we got an XBox 360 and it was my intention all along to get Guitar Hero World Tour or Rock Band to try the drums. Little did I know where it would take me. I played passionately for a year, every week end. I made it pretty far in Rock Band 2 playing in Hard or Expert mode and I finished the awesome Rock Band the Beatles in expert mode. I survived the war declared by my neighbors and totally abandoned my plastic guitar. A year later, my Christmas present was a real electronic drum kit. I picked the Yamaha DTXplorer. I understand it isn’t the best instrument on the planet (neither am I the best drummer) but it is a complete, well built kit. It is a good price and a great way to learn to play for real. I got the drums and look forward to taking some lessons though my weeks are a bit too busy at the moment for me to insert that in my schedule. So, in the meantime, I work on my own thanks to a couple of learning DVDs. Still, sometimes, I want to plug the drum kit to the game(s) to get some help as to what to try and play. I like the Beatles beats lessons in the Rock Band training mode. Whenever I can, I plug the drum to the game and practice away with the metronome. The solution described in this post works for both Guitar Hero and Rock Band. When I bought my plastic rock game, I checked out the instrument compatibility matrix for Xbox and got the Guitar Hero World Tour pack because the Guitar Hero instruments would allow me to play all the games I could ever buy on Xbox anyway. Then, I bought the Rock Band games alone. Okay, later on, I gave in and traded the guitar hero guitar for the Rock Band George Harrison Gretsch. Actually, Derrick done that for me and I got the good looking Gretsch for Christmas, too. Anyway, the point is, because Xbox uses a closed source system to communication between the controllers and the console, it can not be reproduced by any home made hardware (as it is possible for PS3). The great thing about the GH drums, though, is that it has a MIDI In plug. It allows you to do just what we want, plug a real electronic kit to the GH kit and let the GH kit send the signal to the console. So, what if you don’t have the GH kit ? Well, that’s where you can tweak your RB kit with a soldiering gun or buy this little GH drum kit “module” online. Personally, I sold my GH drum kit on ebay for 50 euros and bought the little GH box online for 60 dollars and came out even (quick shipping, great product). So, all you gotta do is plug the DTXPlorer to that box and start rocking… Well, yes and no. The game expects some basic information: yellow, red, orange, blue or green. The real kit, on the other hand, has more notes to offer. So we need to map these notes and describe which is yellow, which is red, etc… If your module allows you to map the notes, everything is simple. If not (and the DTXplorer doesn’t) you need to add a computer in the mix to tackle the job. I use a MacBook running Midi Pipe to do that but I heard of a similar software for PC. As for the midi cable, I suppose you can use any which one. Here is a link to mine (Prodipe Midi USB 1i10). Again, if your drum kit enables midi remapping, you can skip this step altogether and you do not need a computer to connect your kit to the game. If not, here we go. Rock Band and Guitar Hero try to be compatible with each others instrument controllers which is great news for users like me. I don’t think I would have spent the money to get two plastic drum sets and I know for a fact my living room couldn’t hold another of these bulky controllers. That’s why I bought the Guitar Hero Pack. The Guitar Hero controller was an obvious choice since it has the “Orange” pad needed to play GH:WT while allowing to play Rock Band. What I didn’t know at the time was that the GH:WT would prove to be an even better choice because it has the MIDI IN plug. So, the Guitar Hero controller understands Midi and is the bridge between the signal sent by your drum kit (Midi) and the signal expected by the XBox (some wireless Microsoft proprietary protocol). If GH:WT input is midi note 38, the signal sent to each box will be “the red button has been pressed” just as if you had pressed the red button on the regular XBox controller or hit the red pad on the GH:WT drum kit. The Yamaha drum kit on the other hand, is more subtle. It acknowledges a difference between hitting the center of the snare or its rim, it plays a different sound if you play the center or edge of the clash and ride and offers more toms. Each of these actions also have a matching Midi note that the drum kit can send out to a computer using the Midi out plug. Yamaha download center offers the DTXPlorer drumkit user guide which lists the notes sent out by each pad. In order to play the games with the DTXplorer we simply need to map what each pad on the DTXPlorer should trigger in the GH:WT module. For example, the DTXplorer snare sends out the midi note 31. I want it to control the “red” pad in the game. So I must transform the midi note 31 sent out into a 38 for the game to register the hit. That’s what the computer will do for us. 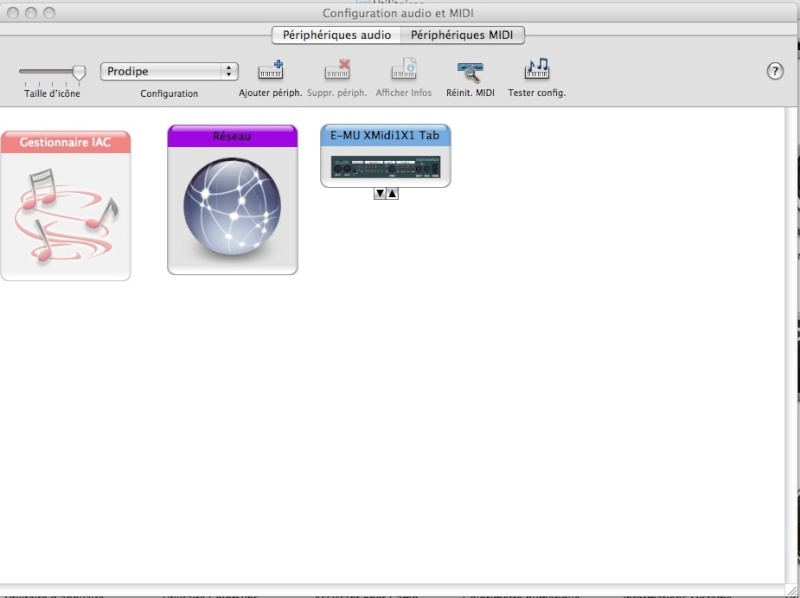 Midi Pipe is a Mac OS X software that allows to do just that. It reads the Midi In, alters it (if necessary) and sends it back out. A PC alternative exists, it is called eDrum Midi Mapper. Once your drum kit is successfully connected to your Mac (see Troubleshooting section below for help on that) launch Midi Pipes. You will have a tool list on the left and a pipe list on the right. Start by dragging the Midi In to the right and click ‘Hijack’. The hijack option will allow us to trick the signal before it is send out. Then, add the Keyboard and check the ‘highlight’ box in order to visualize the signal as you hit your drums. Finally, add the Midi out and uncheck the ‘pass through’ to send out the tweaked signal. Now it’s all a matter of adding Key Mappers for each note that needs to be remapped to its GH:WT equivalent. Add a keymapper element to the pipes and select the drum kit note of a given pad on the left and the matching note for the games on the right. Below is the example for the snare which we map from midi note 31 to midi note 38 (red) in the game. You can now name your pipe and save your setup. Next time, all you have to do is launch Midi Pipe and load your configuration back. Warning: the order is important. As you can see from the table above, for example, we map the 49 into a 46 (clash) and the 51 into a 49 (ride). Make sure to remap the the clash to a 46 first and the ride second or you ride will remap to 46 (yellow). You are free to assign the pads you want to any of the colors you want in the game. It is possible also to have a set of different Midi Pipe configuration to use for different songs in the game as well. Below is a diagram showing the color repartition I chose. I hit the “green” on the real drum kit and nothing happens in the game. Two possibilities: the signal doesn’t make it to the computer or the signal doesn’t make it to the GH box. On Mac OS X, you can make sure that the signal at least gets to the computer by running Garage Band. If Garage Band sees your drum kit and allows you to record yourself, the signal makes it that far and the problem is with your GH box. Check the connections. If Garage Band doesn’t see your drum kit, you have a midi connection problem which I usually solve by launching the Audio Midi Setup application. Go in Window and click on “show MIDI window”. The Prodipe Midi USB appears. I then click on Default (in the configuration section) and select “Create New Configuration). I name it Prodipe and it usually somehow turns the MIDI on. Don’t let your computer go to sleep. At least, with my MacBook, the midi signal is not sent out anymore when the Mac enter sleep mode. If you are using a laptop, you might just be out of battery, too. That would never happen to me though, I’ll get shot by the neighbors if I ever played long enough to exhaust my battery. Electronic kits try to emulate real (acoustic) kits. Some of them will handle two or more signals for the same pad depending on where you hit it (center, side, etc). If you want all these to register with the game you must map these extra notes as well. The hi-hat for example needs to be mapped whether it’s hit when closed or open. You can refer to your kit user guide to get a full list of the notes it uses. I have included the one for the DTXplorer earlier in this post. 71 Comments to "Yamaha DTXPlorer Kit with Rock Band (or Guitar Hero) on Xbox 360"
I’m trying to connect my DTXplorer to my GHWT Drum Kit through an M-Audio 2×2 Annyversary Edition. I’m using the MidiPipe SW and downloaded your config file but nothing happens…. Could you please give me help?? You must make sure that the signal arrives to your computer by running either Garage Band or Midi Pipe. With Garage Band, simply go to the preferences and see if you have a Midi Input detected (if you do, it is most likely your drum kit and you should be able to record it). Another way to make sure is by running Midi Pipe, selecting the Midi In Tool and the Keyboard tool (check highlight) and see if drum hits appear on the keyboard. If the answer to any of these tests is yes, you drum signal makes it to the Mac. first of all I want to thank you for your kind and fast reply! I fixed the issue using MidiPipe, your precious guide and my macbook pro. The problem was in my M-Audio 2×2 Midi Device and after a few tries i finally had success! The final result is pretty nice (to me of course…). I expanded the aluminum rack of mine DTXplorer with a few shelves and installed a 22″ High Res TFT Screen right in front of me, an Asus Eee PC 701 with eDrum Midi Mapper on my right and finally the Xbox 360 controller on the left. I’m glad to know that it worked for you, too. I hope you enjoy the game even more with the setup. Thanks for sharing the information about the MSA-P controller, that sounds pretty interesting. Do you have any photo of your setup? The game now is really GREAT! In the meantime I’ve changed my DTXplorer with a DTXtreme IIs with a few more “accessories” and I’ll be very happy to post some photos asap. I’ve got a DTXplorer running through the Band Hero drums on PS3, and it looks like these notes are one too high. For example, the snare is D2 instead of D3. Thanks for the head start though! thanks for this detailed instructions, I will try this soon. My “drumming career” is exactly the same as yours. Bought myself a Band Hero Kit for the XBOX 360 for Christmas 2009. After playing at least 1 hour each day ever since I finally got my DT Explorer Kit last week. Looking for a good teacher right now, I guess I will start taking lessons in the next few weeks. I´m looking forward to rock Band Hero on my drumset, this is so much fun I really wonder why I never played any instrument in my life before. Glad to help fellow new comers to drumming! Looking forward to my Saturday drumming session tomorrow. If you are using Windows, please post any info you can share about the software to use ; I’ll do my best to update the post for other Windows drummers. I finally got everything plugged together using an old Notebook and Edrum Midi Mapper. When setting up the Software I also found that all the Octave Numbers you list above seem to be one Octave to high. The Midimapper accepts only Notevalues (e.g. C2) as inputs. However you can simply strike a pad to enter the value. Doing this with my Band Hero Controller and my Drumset i now got a mapping that works fine. Thanks for posting the details on your setup and confirming that EDrum Midi Mapper works for Windows users. I’ll have to double check on these note values next time I hook my kit to the MacBook. I agree than switching to a real set adds a lot of fun to the game but that it must be harder cause my score also went down a notch when I switched. I wouldn’t go back for anything, though! I finally found the reason for my abysmal scores when playing Band Hero with the Yamaha Kit. The multizone pads for the snare and the cymbals send multiple hits to the Xbox. When you have to play a red note (snare) most of the time you play two or three notes in rapid succesion as long as the notes for “snare open rim” and “snare close rim” are still assigned to the midi value for red. So you hit the red note (good for the percentage) but at the same time play an extra note, which instantly kills your multiplier. After switching of the additional zones on the pads by assigning midi notes not supported by the game my score and hit percentage increased to the values I´m used to. Strangely it doesn´t matter where I hit the snare or the cymbals after switching of the zones, they still register in the game. I still wasn’t able to start real lessons though I sometimes play along Drumless Tracks. I might have the same problem with the snare, recently, I have lost the multiplier a lot when hitting it (and thought I was off). I’ll try that for sure next time I get to play. Another thing that got me was that somehow, my kick pedal sensitivity changed. I had to hit it a lot harder for the hit to register. It was getting worse every time I’d play when finally I realized there is a setting for that. Much better now. Have fun with your lessons! i am using the Alesis dm6 to do this, and the ghwt brain only recognizes four of the pads i mapped. it recognizes from the high-hat to the second tom. i am wondering what i could do to fix this. if u need any more info, please let me know. hey just a quick question do i need to keep the mapping program on while i play? Yes, you do. And depending on how the mapping software behaves when your computer goes in sleep mode, you might even want to prevent that from happening. Enjoy! Bonjour, je vais te repondre en francais alors. Il m’arrive de devoir bidouiller un peu pour obtenir une connection entre la batterie et le mac. En general, je commence par fermer Midi Pipes. Je vais dans Audio Midi Setup et je detruis la configuration prodipe et je la recreer. Ensuite, je lance MidiPipes, j’ouvre ma configuration et j’edite l’entree Midi in. Je passe de usb a n’importe quel autre choix puis je remets usb. Je fais pareil pour le midi out… Ensuite, a chaque fois, ca fonctionne. Etrange procede mais ca a le merite de marcher a chaque fois. Bonne chance. So I might be leaving this issue up to a faulty midi cable I got 2 days ago online, but it says my midi device is offline which it isn’t. http://i30.tinypic.com/15yjewh.png both drum kits are turned on an I can’t figure out what to do. Help would be greatly appreciated. Unfortunately, I don’t know of any way to make sure that the signal from the PC is received by the guitar hero controller MIDI IN. I would verify two things in your case to try and see where the problem is… Are you sure the signal from the drumkit makes it to your PC (did you try it with a midi app on your PC). If so, verify your settings as to what your MIDI out is set to in eDrums. Hope you get it to work. Hi guys, i’m having trouble connecting my dtxplorer to my pc? i’ve picked up a midi to usb cable from maplin, instaled edrum-mapper, but not sure what else to do? what i’m after is getting my drum kit to work with the xbox 360, i’ve got a GHWT controller but as everyone knows you don’t get to use the second tom, crash and hi-hat foot pedal with it. I’d like to be able to play along with mates on the xbox but to be able to play as i noramally do and not have to use ride when i should be on crash and tapping hi-hat when i should be using the foot pedal. Any idiots step by step would help. Here is a midi to USB wiere from Amazon that looks very similar to mine: http://www.amazon.com/gp/product/B0017H4EBG?ie=UTF8&tag=worwidang-20&linkCode=as2&camp=1789&creative=390957&creativeASIN=B0017H4EBG. i just noticed, you said somthing about a hardware soulition for ps3 user. what is it and where can i get it? i finally got the yamaha connected but it only registers a few at a time, and never 2 drums at once, and as i am writing it. it is just now playing some of the notes, any help? DTXplorer could connect the modulator to the PC, all my senses pads, but I detected several hits in a row I have to wait a while for me to recognize another blow. know how I can fix this? I have just got a DTXplorer drum kit, and want to be able to use it to play GHWT on PS3. I don’t want to have to buy the whole GH drum kit for the sake of connectivity. I can get hold of a brain module only. But I have been told all sorts, that as well as the GH brain module, that I also need the MIDI port from GH drum kit, and drum circuit board, and of course the drum dongle. If I were to get one of these, I could then just use the info in your blog to remap the MIDI via my MacBook right? Or alternatively, if I were to get a drum kit with MIDI mapping capability, I wouldn’t even need to go via my Mac. Is that right? Or do I really need all the extra circuitry they suggest? My setup for playing GH:WT with my DTXPlorer requires only the brain module that you linked above, a USB-Midi cable and a computer (in my case I run Mac OS though a Windows solution exists). Still, this setup might be outdated with the release of the Rock Band 3 Pro-Midi Adatper… I say might as I’ve not yet tested it with GH:WT and Rock Band 2. This is on my agenda for this week end. To answer your second question, that’s correct, either you get a drum kit with mapping abilities or you need to go through the Mac Book to do the mapping. I heard a new brain module with mapping possibilities exist for the DTXPlorer but I didn’t upgrade my kit myself. First off im so glad to see this page and comments is still active. And this Tutorial has helped immensely. Although i Do have quite a large problem. My brother has the DTXplorer and a Mac 24″ connected via usb midi cable.. He downloaded midipipe and the notes registered in keyboard from the patch provided. everything was working well. then.. for no reason The midi input for the usb midi cable went to offline. showing up in the midi in but sayin it is [offline: usbmidi cable] in the drop down box and not registering any notes in keyboard. We have not altered anything in anyway and we are curious if you know what might of happened and why the usb midi no longer says online or working. I have a suspicion is a mac driver issue because i tested it on my pc laptop with edrum and everything worked perfectly.. he was able to play guitar hero with remapped keys without a problem. however i cant lend him it all the time. So do any solutions or ideas come to mind? As it turned out I have encountered the same problem and found a (somewhat annoying) turn around. Actually, it came to the point where I would never turn off the MacBook anymore and always let MidiPipes running in the background so I wouldn’t have to do the following steps below every time I wanted to drum. Though it’s not that bad really. – you should have a drop down list with default, add and edit configuration. – hit the drop down and say new configuration and name it something. – hit a pad on your kit, a key should highlight on the keyword. Meaning: the signal makes it to the Mac. – in the device list, select something else than the USB midi device. Then select again the USB midi device. One more thing, if that works for you… Next time you use this trick, when you arrive in Audio Midi Setup, you’ll see the configuration you created this time around. You need to delete it. And recreate it. And do the rest of the steps and it’ll work again. I do not know if the problem comes from my MacBook (it’s an old one updated to Snow Leopard), if it’s an Apple issue or a problem with either my USB midi wire or my kit. I messed around trying to reinstall MidiPipes and such, nothing helped but this solution always worked. Be on the lookout, in the next few days, for a major follow up to this drumming post as I now have Rock Band III working in Pro Mode. Is Anyone using edrum midimapper. Has anyone saved their kit that they wouldn’t mind sharing. Maybe if I can start there? I really want this to work. You actually make it appear so easy along with your presentation however I find this matter to be really something which I believe I might by no means understand. It kind of feels too complex and extremely wide for me. I am having a look forward in your subsequent post, I’ll attempt to get the cling of it! Any way to use the Hi Hat Control Pedal as a second bass pedal? So it turns out I’ve got everything you have Shalfon, but can I use it for my PS2? Thanks, Sir Anthony the greatness. Sorry Samantha, but can DTXplorer’s remap MIDI? No, the DTXplorer does not remap so the whole computer in the middle trick is necessary. The drumkit is compatible with the Rock Band 3 game adapter though. My midipipe setting aren’t setting when I quit Midipipe, I’ll have to do them again! You are the best man alive! I have dd501 alesis drum kit which send midi signal, but it doesn’t have a midi output, USB is used instead, I bought a simple usb to midi cable, and used your tutorial (i only didn’t have to remap the signal code). It works even better than the original guitar hero drum controller. Thank you very, VERY, much!! Glad it helped ! This is a very old post but I still enjoy my setup often. By the way, if anyone tried the latest games, Rock Band 4 and up, I’d love to know how it works for you, I’m stil playing Rock Band 2 and Beatles and Guitar Hero Metallica. You really need midi out only, do you have that ?